5. (729)2 × (117)2 ÷ (13)2 × 35 = 3? 6. If the court charged a fee of 456 on each case registered in Criminal cases in the month of September, what was the total fee collected on the Criminal cases in the same month? 7. If 35% of the case registered in Civil cases during October were not have proper witness, how many cases registered in Civil cases during that month were have proper witness? 8. The number of case registered in civil cases during June is approximately what percent of the number of case registered in civil cases during November? 9. What is the respective ratio of the number of case registered in Criminal cases during June to those case registered during November of the same case? 10. 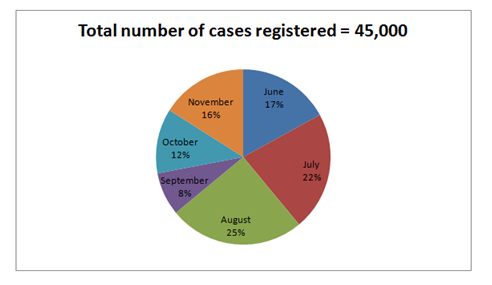 What is the total number of case registered in Criminal cases during July and August together? 5) (729)2 × (117)2 ÷ (13)2 × 35 = 3? 6) If the court charged a fee of 456 on each case registered in Criminal cases in the month of September, what was the total fee collected on the Criminal cases in the same month? 7) If 35% of the case registered in Civil cases during October were not have proper witness, how many cases registered in Civil cases during that month were have proper witness? 8) The number of case registered in civil cases during June is approximately what percent of the number of case registered in civil cases during November? 9) What is the respective ratio of the number of case registered in Criminal cases during June to those case registered during November of the same case? 10) What is the total number of case registered in Criminal cases during July and August together?